An independent observer of the 2014 Afghan general elections offers his impressions of Afghanistan’s historic election day. On April 5, 2014, a team of four “Special Guests” (independent observers) of the Afghan Independent Election Commission (IEC) comprising Professor William Maley, Mr. Fazel Haq Saikal, Dr. Liza Schuster, and I visited a total of ten polling centers in Kabul at which votes were being cast or counted for the Presidential and Provincial Council elections. In addition to observing and documenting polling procedures, our team was keen on capturing the atmospherics of polling day. The following notes reflect briefly my experiences observing Afghanistan’s historic 2014 national elections. Our four-member team had intended to travel to the neighboring province of Kapisa (and the districts of Shomali and Istalif) to observe rural polling stations, before heading back to the urban confines of Kabul. The plan, however, was undermined by news that Kabul was blocked-off (making it very difficult to re-enter the city). The team decided to remain in Kabul city and observe different stations in its various neighborhoods. The team’s experience got-off to a curious start. We reached the Abdul Ghafoor Nadim School in Khair Khana at 7:45 a.m. A substantial queue of voters had already gathered, and one FEFA (Free & Fair Election Foundation of Afghanistan) observer was present, but polling had not commenced as the staff of the IEC was not present. By 8:25 a.m. – after almost ninety minutes of waiting – frustrated voters in the queue informed some of our team members that they had contacted TOLO television in order to highlight their displeasure and quandary. In the meantime, the headmaster of the school, after receiving telephone instructions from the absent IEC official, had begun to unpack electoral materials from the blue boxes in which they had been delivered. Voting finally commenced around 8:45 a.m., shortly after the arrival of the harried IEC official. It was curious to learn from the IEC official that he was delayed on account of being held-up at a previous polling center (a senior UNDP staffer advising the IEC confirmed to me later that IEC officials were designated to only one polling center). There were a total of three polling stations for male voters, and one for female voters. Our team then reached the Khalilullah Khalili School in Khair Khana at 9:15 a.m. The queues at this venue were extremely long and slow moving but orderly, despite voters having to wait in mud. In the men’s section (two polling stations), procedures were followed reasonably well, although in one room, only the purple indelible ink was being applied and the spray-on, ultraviolet-sensitive marker, was not. Voting proceeded smoothly although team members were struck that some of the electoral workers were moving at a much more labored pace than others. There was nothing, however, to suggest that this was part of an organized “go-slow.” Dr. Schuster reported that women of all ages were voting in the women’s section, but that the atmosphere was somewhat chaotic. At one stage, while attempting to enter a polling station, some voters in the queue mistook me to be a Pakistani and objected (though not aggressively) to my presence at the center. Team member Mr. Fazel Haq was quick to dispel the notion, indicating my Indian heritage and nationality – this brought a favorable change to the voters’ attitudes. Next, the team reached the Abdul Qadir Bedan School in Khair Khana at 9:55 a.m. By far, the queues outside this center were the longest the team encountered on the day. The atmosphere was buzzing with anticipation and hope. Our team, however, was denied access beyond the perimeter gate to the polling. To Professor Maley and I it appeared that the security official blocking the way was simply unfamiliar with the concept of “Special Guest” – he even indicated that “International Observers” had been assigned to designated centers; team members proceeded to explain that as “Special Guests” (not ”International Observers”) we had uninhibited permission and access to observe any polling center throughout the country. This initial impression was somewhat challenged when Mr. Fazel Haq and I overheard a telephone conversation between the same security official and his superior where the latter said in clearly audible Dari, “If they are UNAMA [United Nations Assistance Mission in Afghanistan], then do not let them in.” The conversation would appear to suggest that the persons involved were National Directorate of Security staffers and believed that our group was associated with UNAMA. This curious exchange highlights the government’s fear of electoral manipulation. When the team was finally allowed entry it encountered an arriving group from Democracy International – the only international observers we encountered on the day – and at that point all were granted access to the polling site. There were a total of six polling stations for men. Voting was proceeding smoothly and a FEFA observer was present at the center. During the twenty minute wait inside the gate of the school, we observed that the men entered through the vehicle entrance while the women entered through the narrow “chowkidar” gate. A member of the ANP (Afghan National Police) was allowing women through in small batches to be checked. Each time he opened the gate, women would try to push their way in, and he had to shoulder the gate shut to stop more coming through than the female security guards could cope with. The crowds of women voters barging through the entrance doors pointed to a strong interest in participating in the electoral process. The team reached the Zarghonar School in Qala-e Fatullah at 11:20 a.m. This was the first center at which we encountered a substantial foreign media presence. Crews from the BBC and Agence France-Presse were interviewing female voters, and two members of our team (Mr. Saikal and Professor Maley) were interviewed by Lyse Doucet for the BBC. At the polling stations themselves, we were struck, once again, that some of the electoral workers were moving at a much more labored pace than others. After a lunch break, our team proceeded to the Imam Hassan Mujtabad Mosque (01/01/094) in Dasht-e Barchi, which it reached at 2:20 p.m. As in the previous centers, the mosque had been partitioned internally into two areas, one for men and one for women, and polling proceeded in a very efficient fashion. There were three polling stations for men. The IEC manager informed me that the security guard at the entrance was letting six voters in every two minutes. Outside the mosque, there were a large number of minibuses which had been bussing voters to the polling center – a testament to the famed organizational ethos of the Hazara community. At 2:50 p.m., the team arrived at the Madrasa Khatamal Anbiar in Dasht-e Barchi. Conditions here were not ideal – the tarpaulin roof was leaking rain and it was very cold inside. At one of the three stations in the men’s section, ballot papers for the presidential election were on the verge of running out, while at another, ballot papers ran out shortly after our arrival. At this center we began hearing rumors that ballot papers for the presidential election actually had run out at other centers in the vicinity. At 3:25 p.m., our team paid a brief visit to the Habibia High School, where it encountered Mr. Nader Nadery, the Chair of FEFA. He informed us that his observers were reporting high levels of turnout from much of the country. Curiously, however, the voter manifests at Habibia High School told a different story – numbers at the school were far lower compared to the previous polling centers. In fact, our team encountered very few voters at this Center’s polling stations. Dr. Schuster reported (after checking the female voter manifests) that women’s numbers, too, had been low. Some women informed her that many had refused to come out and vote at the center because of threatened violence, while others intimated their apprehension to vote seeing the strength of the security outside the polling center; this suggests women are not just afraid of the insurgent threat, but are intimidated by the presence of ANSF (Afghan National Security Forces). At 3:45 p.m., the team arrived at the Sardar-e Kabuli School in Darulaman. Here, at the male polling stations, ballot papers for the presidential election had run out at around 1:30 p.m., and the IEC staff had excluded ”Candidate Agents” from the rooms where cast ballots were being held, and had locked the doors. Some agents saw this as a mechanism to ensure the security of the ballot papers, but a number of others expressed concern that this apparent loss of transparency could provide an opportunity for irregularities to occur. A local media team had arrived at the scene to report on the situation. Other agents complained that large numbers of voters had returned home (despite having waited for long periods of time) once ballot papers had run out; they requested that we contact relevant persons to ensure the delivery of more ballot papers. Dr. Schuster informed the team that one individual present (who did not seem to be an agent or an election worker) was dismissive of the agents’ complaints about the shortage of ballot papers, arguing that there were other polling stations close by where people could vote. At 4:20 p.m., our team arrived at the Mohammad Hashem Miawandwal School in Kart-e Naw. 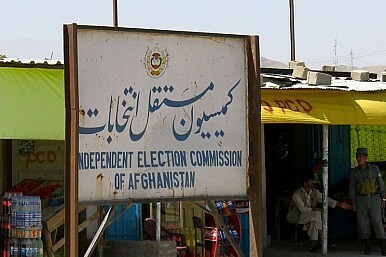 The polling staff had been informed, correctly, by the district manager of the IEC that the chair of the IEC, Dr. Nuristani, had authorized the extension of voting time by one hour to 17:00 p.m. By this time, however, there were few voters left at this particular polling center, with staff reporting a heavy turnout earlier in the day. At one of the stations, I identified a discrepancy between the number of voter ID cards apparently recorded in the written manifests, and the number of voters (somewhat larger) that staff maintained had actually voted, but the team was not able to determine what the explanation was for this discrepancy. The team also noted that at this polling place there was effective wheelchair access of which one voter was making use. Finally, at 5:10 p.m., the team arrived at the Hazrat-e Omar Faroukh Mosque in Kart-e Parwan to observe vote counting. This was conducted very effectively by the polling center manager who at all stages informed candidate agents of what he and his staff proposed to do and how they proposed to do it. After the numbers of the tamper-proof seals on the presidential ballot box were read aloud for the candidate agents, the seals were cut, the box was opened and the ballot papers then held aloft one by one by staff so that the agents could see that each paper had been appropriately stamped by the IEC official who issued it. At this point, the manager held up each ballot paper, announced for whom it had been cast, and handed it to staff to put it in an appropriate pile for that candidate on a wide table that had been built out of cardboard boxes. Several ballot papers were blank and deemed invalid. One voter had written “Love you” in English next to the name of Dr. Abdullah Abdullah; unfortunately for the voter, this ballot paper was then deemed invalid on account of its having been “defaced!” The manager, wisely, sought advice by telephone from his superior before ruling on the validity of this particular paper. The overall success of the electoral process, beyond Kabul, portends well for Afghanistan’s future. First, while some commentators were foreshadowing a low voter turnout (because of the expected violence), voter turn-out had in fact been impressive throughout the country right from the early hours of the morning on polling day. This is a testament to both the outstanding work of the ANSF, and of Afghan resilience and thirst for the democratic process. Second (and following from the above), in spite of cold, wet, and muddy conditions, voters in Kabul were generally committed to and enthusiastic about the process. Though they waited patiently and quietly for the most part, they were assertive about exercising their rights. Throughout the day, at every center and station, there was a readiness to joke and engage in banter which, given the security concerns and precautions, was surprising. Third, April 5, 2014 may prove in hindsight to be a turning point in Afghanistan’s history. The relatively peaceful polling day (the Interior Ministry confirmed a number of attacks along the eastern border) and the almost 60 percent voter turn-out are not just slaps in the face of the Taliban insurgency, but a major victory for the electoral process itself. While not without discrepancies (polling stations running out of ballot papers – a consequence of the lack of a voter-registration process – and centers reportedly closing at 1:30 p.m.), the election was a success for electoral competition, a necessary criterion for successful democratic transition. Finally, our observer team was struck by the professionalism of local IEC staff. Clearly, the extensive training program under the aegis of the IEC and international community proved critical to the polling success. On polling day, we encountered several individuals who had been IEC workers or managers in previous elections, and thus had accrued the necessary skills and experience to manage a successful process. We would, therefore, strongly recommend the UNDP (United Nations Development Programme), Afghan Government, and IEC to consider implementing a process whereby outstanding Afghan electoral staff can be identified and rewarded – this is critical to ensuring competent staff are retained, allowing for institutional learning and development. Notwithstanding the above-mentioned positives, what can the Afghan people and international community expect in May 2014 (for the run-off)? I begin with the prospect of ironing out logistical discrepancies. For instance, four to eight weeks is simply not enough to solve the issue of the shortage in ballot papers. As I have previously indicated, the shortage in ballot papers has a root cause that will need to be addressed – perhaps in time for the 2015 Parliamentary elections, but certainly not for the Presidential run-off. First, printing more ballot papers is a costly enterprise. Second, given the time-constraints and costs associated, how does one determine how many more ballot papers to print and the distribution schema (without accurate voter-registry numbers, how does the Government and IEC determine which districts and centers get more)? Third, and crucially, printing more papers contradicts the original intent of supplying polling stations with 600 ballot papers each – that of preventing potential fraud. Let this, then, be a lesson to both the future government and its international partners – voter registry is a must and cannot be delayed. Next, it is difficult to predict future turnout numbers. Supporters had been turning up for days in record numbers at rallies; Dr. Abdullah’s campaign rally in Panjsher, for example, brought nearly 50,000 supporters – a record figure for the city. While campaigns themselves were somewhat responsible for mobilizing supporters (the youth in particular), the majority of Afghans have shown genuine interest and enthusiasm for electoral competition. The mass mobilization of citizens is both a testament to the Afghan people’s resilience and indicates the progress of the democratic project in the country; despite the security risks and threats, the large numbers present at mass rallies and polling places was unheard of in Afghanistan’s political history. On one hand, therefore, the high turn-out of April 5 may have a “cascade” effect leading to even higher numbers in May (a five to seven percent hike is not implausible). On the other hand, a run-off may serve to dampen enthusiasm and convictions; voters may think to themselves, “I have already voted once; what is the use of doing so again?” The panacea for apathy is to assure voters that their votes actually count. This is precisely why I highlight the need for a run-off as opposed to a power-sharing compromise between the leading candidates before the run-off. There is the perception among the populace that elite backroom dealings undermine both the democratic process and voter demands and aspirations. Regardless of the identity of the losing candidate, voters need to perceive that their votes count and their candidates are elected through the designated democratic process. Last, but not least, despite talk of discord within the ranks, speculating why the Taliban did not carry out devastating attacks on polling day does not mean that they will not (try to) do so next time. Just as with the rest of the world, the Taliban, too, may have concluded the inevitability of a run-off and saved their worst for later. The ANSF worked tirelessly and assiduously, and often without adequate recognition for their achievements. While the international media focused on the insurgent attacks that did take place (the March 21, 2014 Serena Hotel attack, the April 2, 2014 attack at the Interior Ministry), there was little mention of the scores that the ANSF foiled – unofficial estimates suggest 140 attacks were foiled during the immediate lead-up to polling day. Without doubt, the massive turn-out on polling day was largely possible because of this success. Security in Kabul was particularly high on polling day; on that day, there were check-points at every corner and crossroad, with security personnel conducting thorough vehicle and individual searches. Our observer team had to produce identity cards often, with our cars checked for contraband. At polling centers, we were patted-down thoroughly (as were all voters). Understandably, however, the professionalism of the searches waned as the day wore on; by the afternoon, our convoy was waved through by officers, the pat-downs were no longer thorough, and a general lethargy overcame the anxiety and eagerness of the early hours. To ensure another success, the ANA (Afghan National Army) and ANP will need to maintain their vigilance. Mr Srinjoy Bose is a Prime Minister’s Endeavour Scholar at the Australian National University. In April 2014, he was a Special Guest observer at the Presidential and Provincial Council elections in Afghanistan. Presidential candidate Abdullah Abdullah declares victory prematurely, throwing Afghanistan into crisis.